Based on the 1831 novel by Victor Hugo, The Hunchback of Notre Dame as a stage musical retains the songs of the 1996 Disney film while keeping more of the darker, more serious elements of the novel than does the movie. 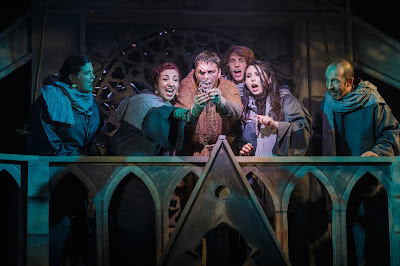 This is not a musical that guarantees a happy ending; but under the direction of Riley Costello, the current Hillbarn Theatre production absolutely proves to be inspiring, moving, and uplifting as well as musically stunning in every respect. The Hunchback of Notre Dame continues through September 10, 2017 at Hillbarn Theatre, 1285 East Hillsdale Boulevard. Tickets are available online at http://www.hillbarntheatre.org or by calling 650-349-6411. 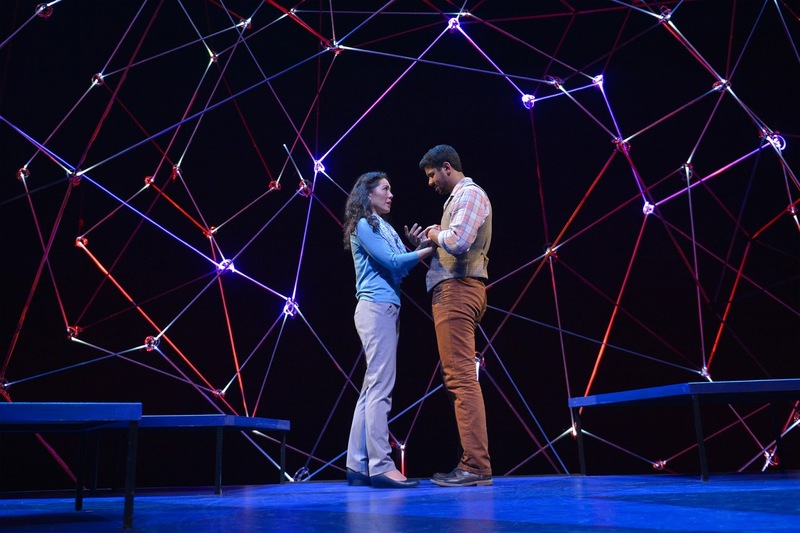 The multiple possibilities of the milestone interactions occurring over the lifetime of one couple’s relationship is the focus of Nick Payne’s Constellations, now in a regional premiere at TheatreWorks Silicon Valley. There is not a minute of the short seventy-two that is wasted in Constellations. Each is engaging, often fun and funny, and sometimes, heart-breaking. Constellations continues through September 17, 2017 at TheatreWorks Silicon Valley, Mountain View Center for the Performing Arts, 500 Castro Street, Mountain View. 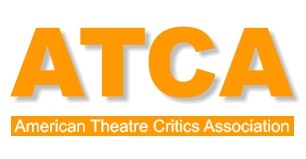 Tickets are available online at http://www.theatreworks.org/ or by calling 650-463-1960, Monday – Friday 11 a.m. – 6 p.m. and Saturday – Sunday, Noon – 6 p.m.
"Day 11, Shows 32-35: TheatreEddys Goes to the 2017 Edinburgh Fringe Festival"
Poet, playwright, and performer Inua Ellams, wearing a t-shirt that boldly says “Never Forget to Say Thank You,” sits at the microphone before the Traverse Theatre audience to relate a story of the many years he and his family take to become legal immigrants within Great Britain. An Evening with an Immigrant, written and performed by him, often sounds more like a spontaneous, created-on-the-spot conversation that is generously peppered by the performer’s own poems that are half-read, half-recited. The next fourteen years of he and his family “trying to belong somewhere” become a roller-coaster in both England and Ireland of some ups and a lot of downs as inept, even cheating lawyers and unsympathetic judges over and again make it impossible for the family to receive permanent papers. Poems of the young poet — who increasingly becomes recognized and honored for his poetry — continue to express the emotions of such a journey in ways that the performer’s conversational interludes are not able to do as well. For the audience, An Evening with an Immigrant is mesmerizing in the beauty of the poems’ lyricism and metaphors while also tension-filled as the actual trials of the journey are revealed. The ninety minutes of the total story begin to feel bit too long; with some editing and tightening of the story as well the performer choosing not to take a mid-performance break of 5-7 minutes, maybe 60-75 minutes would be sufficient. That said, An Evening with an Immigrant becomes a incredibly powerful classroom concerning Great Britain’s system that immigrants must maneuver and of the tremendous costs — emotional, psychological, and financial — that bureaucracy has on them. When Inua Ellams admits, “Without a doubt, poetry saved my life,” we are thankful that was the case both for the poems produced and for the incredible man sitting there before us to give first-hand witness of what it can mean to be a modern-day immigrant. A hurricane is fast approaching New York, and a household in the Lower East Side is busy preparing to ride it out even as the family awaits the return of a Navy Seal son and brother who has been awarded a medal for his bravery in Afghanistan. The Puerto Rican family refuses to go to a shelter because of Evelyn’s fifteen-year-old daughter who is severely brain damaged and cannot breath without help of a machine (not eat or speak on her own). To ensure Candice’s dialysis machine will continue to work, Evelyn has brought a generator into their fifth-floor, walk-up flat but has not had time yet to read the instructions for its operation. Besides preparing for her brother’s welcome, she is trying to appease her alcoholic father who only wants to play the numbers before the storm arrives. She also wants to make sure the elderly Jewish woman below them who is having memory issues has what she needs before the storm hits. The most remarkable part of the story being told in Pike Street is that all these and more residents of the ethnically rich neighborhood are all played by the piece’s author, Nilanja Sun. We first see the mouthpiece of this one-person show sitting with a body grossly distorted — head slanted precariously upward, mouth severely askew, and both hands and legs knotted in ways that make one cringe to see. This is our introduction to Candice, and the performer will remind us from time to time how the 15-year-old is reacting to the people and events around her. For all the other characters, Ms. Sun employs an incredibly impressive range of voices, accents, body positions, and ways of walking to bring each of the people to life on the stage-in-the-round. As the thunder begins to rumble and the rains and winds pick up in intensity, the story inside the house also intensifies as emotions become raw not from the storm, but from histories leaving scars that get rubbed raw by memories jarred, challenges made, and stories retold. Before the eye of the passing hurricane hits, an unexpected storm explodes within the household; and our final image of a young, invalid girl of fifteen takes on new significance given what this family has been through in deciding to ride out the storm. Through a series of often funny and even outlandish scenes that are also touching and emotionally powerful to watch, Kit Redstone and his fellow three actors (Daniel Jacob, Julian Spooner, and Mathew Wells) explore manhood in its many and varied forms. Musical numbers (mostly performed by Daniel Jacob as “the Diva”) and well-executed and often hilarious choreography (directed by Matthew Wells) accent the Mr. Redstone’s narration and the interactions with and among the pretty boy, muscle men of the gym. Kit’s mistakenly taking one of the other guy’s towels to use as his own as a wrap around his otherwise naked body becomes the spark for an entire series of showdowns and challenges, all leading to a climatic revelation that proves nothing can beat live theatre for maximal, emotional impact. Director Julian Spooner has made some brilliant choices in making this story fun, exciting, educational, and heart-warming all at the same time. But at its core, the reason Testosterone succeeds as a terrific hour of theatre is because of Kit Redstone ability to be and tell a story that needs to be seen and heard far and wide. The fifteen-century story of Joan of Arc — a woman warrior who leads an army of French patriots against the invading English — is told in a more modern-day version while keeping all the historical context and characters in a one-woman show, Joan. Written and directed by Lucy J. Skilbeck, Joan is performed at the 2017 Fringe by Lucy Jane Parkinson, herself a rather butch-looking warrior with ample metal and tattoos on her body and a walk that is more stomp than not. There is a Scottish ring to this Joan’s voice and the people we meet via Ms. Parkinson’s solo performance, even through the characters are mostly all French. A character we never see but is always present for Joan and the telling of her story is St. Catherine, from whom Joan takes her heavenly charge and whom she seems to consider her best friend and confident. Her Joan keeps looking for Catherine to appear, even making an audience member move to clear an aisle-visible chair for the expected heavenly visitor. Ms. Parkinson has a certain crude, unpolished roughness of style and approach that works to some extent in her portrayal of Joan but also at times almost appears sophomoric. The story progresses to the expected fiery climax that every schoolchild knows from history texts. In the end, a gender-bending, modern look at the Joan of Arc story proves mildly intriguing and amusing without quite proving the point of its undertaking. "Day 10, Shows 26-31: TheatreEddys Goes to the 2017 Fringe Festival"
Tony Carpenter as Stan Laurel and Philip Hutchinson as Oliver Hardy recreate the life stories of these two partners attached as one entity to each other, on and off stage. We hear of their shaky beginnings, meteoric rise to international fame, marriages successful and marriages disastrous, stardom on stages and on screen, their slow declines in health and well-being, and their remarkable abilities to rise as a combined Phoenix time and again up until the very end. But better yet, the two actors recreate both on live stage and in projected film clips a number of the pairs’ most famous skits, complete with the gestures and grimaces that still bring smiles, chuckles, and outright laughter whether being seen for the first or the hundredth time. Hats off to Messieurs Carpenter and Hutchinson for a fabulous Hats Off to Laurel and Hardy. Three young women, ranging in age 17 to 22, feel trapped in the walls they have each built around themselves. Their prospects for breaking out are not clear to them or to us as we begin to see glimpses of their lives on a stage defined by three, rather claustrophobic spaces that touch but are in many ways, worlds apart. Isla Cowan’s new play, These Walls, is a gripping story of how one event gives them each a possible crack into a future that may not be as bounded by personal expectations and self-defined boundaries as are their present realities. Imogen Osborne is Chrissy, always fearing her aging (at 22?) body is losing the beauty she believes so defines who she really is. As a dancer in a club, she too often draws the attention of men who only see a possible hook-up versus an intelligent woman who might be fun and interesting to get to know. Ms. Osborne brings an intensity that particularly shows in eyes that pop with feeling and expression. She exudes a frustration that “people look at me and just see hot,” even as she continues to sit in front of a mirror and worries about creeping wrinkles that only she can see. Caught in a relationship where she feels both intense hate and total love, where “nothing changes except at the same time, everything does,” Althea is perhaps the saddest of the three women imprisoned in walls invisible to everyone but themselves. Cecily Pierce gives a compelling, often heart-breaking performance of a pensive, tense, worried-looking woman in a relationship that seems to offer her nothing but pain — except for surprise kisses that always seem to cause her to forget that pain and to love him again. Nothing changes. But something does change for each of these women whose lives begin to intertwine in much the way their monologues often do with one’s interrupted sentence abruptly leading to another’s spoken thought. The result is a set of three stories becoming one in order to allow three women to figure out what they need to do to escape These Walls. Three generations of dads and sons gather at the home of oldest among them, Jonny, to celebrate the coming of the new year. And while Jonny is eager to call upon many old traditions to celebrate Hogmanay in the Highlands of Scotland (from foods to decorations to the command of each person to write and share an original song or poem for the new year), there is not much tradition among the three of them for spending time together. Jonny is seeing his twelve-year-old grandson, Jack, for the first time since the boy was two. His son John is hosting with great reluctance the son (Jack) he shares with his ex, bringing the boy to his own father’s house that he rarely visits any more. In the meantime, good friend Fisher is coming in and out, trying to keep the spirits of the strained reunion up as he too gets drawn into Jonny’s desire to have a Scottish New Year rich in traditions that might just heal the many rifts and resentments among this mixed-generation family. Ilona Munro’s The Recovery Version is a mixture of family dysfunction that is both funny and sad, of relationships showing both some promise of genuine renewal and some serious possibility of final blow-up, and of traditions that both have the promise to bind as well as the power to divide. Through the music of Paul Hornby-Battrick and Chaz Stewart, new songs rich in Scottish Highlands sound interject themselves to remind the gathered family and their friend of feelings forgotten, of feelings perhaps never experienced, and maybe of feelings now desired. Performances among the principals are overall excellent enough (George Carson as Jonny, Paul Hernaes Barnes as John, and Glen Alexander as Fisher), but it is the young Holly Baldwin as Jack who particularly leaves a memorable mark. She captures fully the initial sullenness so predictable in a boy twelve who has once again been largely ignored by a dad he rarely sees and handed off to a grandfather he hardly (actually does not) know. But this young Jack blossoms in every dimension as he and Jonny form a special relationship that surprises them both, and the breadth and depth of the transformation in Jack is a joy to behold. A son returns home to claim his deceased Italian dad’s shop known for its crisply fried potatoes, fish, and chicken. He finds a shop not much better than a decaying dump; and he also begins to find mysteries of a business that has been long failing even as its walls are full of faithful customers who thought of his dad as family. As he rummages through boxes in preparation for a sale of the property, he begins a journey through memories of voices past and of moments long forgotten but now as real as if they were occurring in the present. Lorenzo Novani writes and performs a tale, Cracked Tiles, of a son’s searching for a truth about a father now dead but whose lingering clues and messages add up to a mystery the son is compelled to solve, no matter the answer. Recreating characters of the old neighborhood as well as of a family now all gone, Mr. Novani is a master of mixed voices and persona. An uncle stoops with hunched back and speaks out of a mouth that is long, thin line across his old face. A young boy — in fact himself — wanders around the store, sitting on mounds of potatoes as if king for a day. A customer shuffles in with an accent so heavy that understanding is near impossible. These and many more memories flood the decaying walls of the store as the son wanders through signs of a truth he still seeks. Even the best of intentions about a subject as universally important as an aging parent’s dementia cannot help a piece that is highly disjointed, full of over-done and frantic theatrics, and scattered with symbols that really do not make a lot of sense. Rob Gaetano’s My Pet, My Love may be his attempt to bring to greater understanding of his own mother’s long and sad demise; but neither his script nor unfortunately his interpretation is yet ready to bring this new work to a staged performance. Had the audience been larger than the three of us, I can assure you I would have been tempted to slip out long before the very long hour it took for the piece to conclude. Four New Yorkers living parallel lives are temporarily lost and roaming rather aimlessly in a search whose goals are still being defined by each. Told only through the lyrics and music of Adam Gwon, Ordinary Days is a story where an afternoon at the Met can go in one of two ways: boring or life-changing. The answer lies in how much each person is willing to break out of old patterns and risk moving into territories not yet fully surveyed. Warren is an artist who mostly now only hands out flyers on the streets of the Big Apple while apartment sitting for a real artist. A bit dorky in his red glasses and tight-fitting, grey, knit cap, Warren (Neil Cameron) sings with a voice often reminiscent of a boy much younger in numbers like “Life Story,” which details his exasperation of where he now finds himself as a wanna-be artist. Deb (Nora Perone) is a student in grad school who sings “Don’t Wanna Be Here” in a voice that sometimes spreads the sung tones a bit too thin but who overall is terrific in conveying the fear and frustration of a young woman who loses all her thesis notes for a dissertation she is not sure she wants to write. The two have a shaky beginning after he finds her thesis notes on a bus seat and tries to use it as a way to spend time with her. Two lost souls look for ways to help each other while having greater issues how to help themselves. While the song lyrics at times become a bit wordy bordering on over-dose, over all the songs do convey a series of four, interlocking stories that build to a climax that is fun and heart-warming. Jen Coles does a good job in directing the flow of over twenty songs, most defining its own new scene and singer. Full ensemble numbers like “Saturday at the Met” and “Rooftop Duet/Falling” are engaging and often exciting as directed by musical director Rowland Brache. In the end, the one hour, ten minute musical flies by with a set of stories that prove that Ordinary Days” is not at all simply ordinary.